Paul Laurence Dunbar was a seminal American poet of the late 19th and early 20th centuries. Dunbar gained national recognition for his 1896 book of poetry, Lyrics of a Lowly Life. The Heart of Happy Hollow is a short story collection by Paul Laurence Dunbar that focuses on the experiences of African-Americans after the conclusion of the Civil War. This is a collection of poetry by African American author Paul Laurence Dunbar. Dunbar's work frequently features a conversational tone, innovative rhetorical structure, and a colorful use of both dialect and mainstream English. Dunbar was among the first nationally successful African American writers. This poem is by African American author Paul Laurence Dunbar. Dunbar's work frequently features a conversational tone, innovative rhetorical structure, and a colorful use of both dialect and mainstream English. Dunbar was among the first nationally successful African American writers. FCIT. "Paul Laurence Dunbar author page." Lit2Go ETC. Web. 20 April 2019. <https://etc.usf.edu/lit2go/authors/172/paul-laurence-dunbar/>. 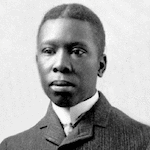 FCIT, "Paul Laurence Dunbar author page." Accessed April 20, 2019. https://etc.usf.edu/lit2go/authors/172/paul-laurence-dunbar/.